In an agriculture industry that’s heavily dependent on fossil fuels, Salinas-based Taylor Farms is making national headlines for its radical steps toward clean energy. 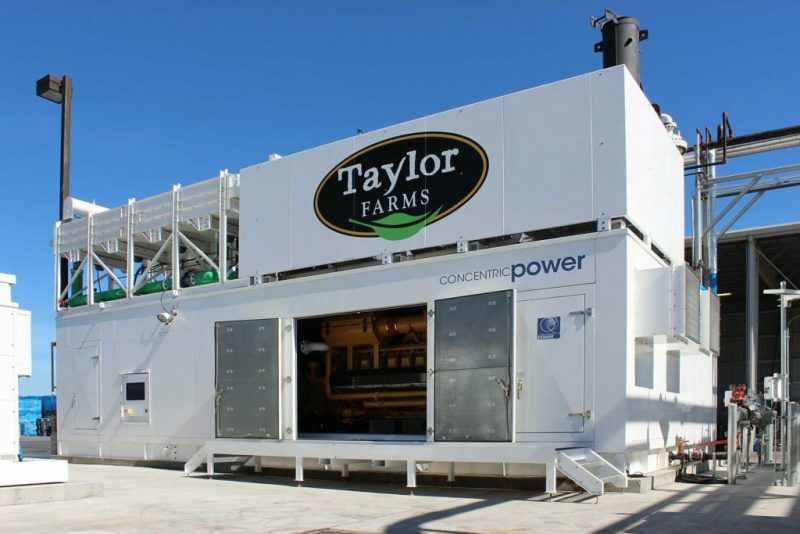 In an effort to shrink its environmental footprint and promote sustainability in agriculture, Taylor Farms recently completed a makeover of its energy ecosystems and is now using wind, solar and co-generation systems to power its production facility just south of Salinas in Gonzales, CA. Taylor Farms predicts this initiative will offset energy use at the facility by 90 percent. The largest factor in the energy cuts is the cogeneration system, a 40-by-60 foot plant that uses natural gas and waste heat to provide refrigeration for the farm’s vegetables. The system was installed in April of this year, and Taylor Farms expects that it will produce an annual energy offset of 64 percent. This system was created by Salinas-grown startup Concentric Power, which was one of the Western Growers Center for Innovation & Technology’s inaugural residents. Taylor Farms Director of Sustainability Nicole Flewell says the use of three different sources of renewable energy allows Taylor Farms to make the most of the Salinas Valley’s sunny weather, as well as the production facility’s location in a Monterey Bay wind channel. But when the wind doesn’t blow or sun doesn’t shine, the cogeneration system allows for a reliable baseline energy source. In total, Taylor Farms’ new sustainable systems are 21 percent cleaner than a utility grid.